Olefinic thermoplastic elastomers, as defined in this report, include thermoplastic polyolefins (TPOs), thermoplastic vulcanizates (TPVs), and reactor-made thermoplastic polyolefins (r-TPOs). These elastomers are two-component systems consisting of an elastomer (such as EPDM) finely dispersed in a thermoplastic polyolefin (such as polypropylene). The thermoplastic polyolefin is usually the major component and is usually the continuous phase. Such compositions can often be considered either TPOs or impact polypropylenes and the boundary between them is not universally agreed upon. In this report, olefinic thermoplastic elastomers are defined as compounds of more than 20% elastomer content in polypropylene. There continues to be growing interest in olefinic thermoplastic elastomers because of their ease of processing, greater design freedom, lightweighting ability (especially in automobiles), and their ability to be recycled. The automotive industry is the largest market for olefinic thermoplastic elastomers; in 2016, it accounted for nearly 70% of the total global market. Penetration is considered high, and continued use for automotive parts and components in passenger car and truck interiors, exteriors, and under-the-hood applications is seen as promising. 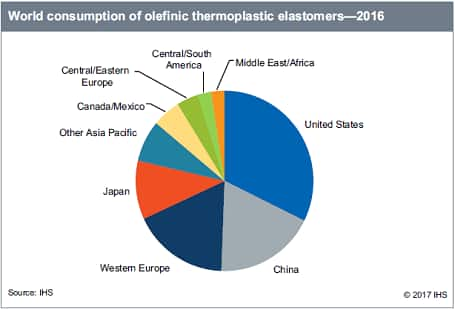 The United States is the largest consumer of olefinic thermoplastic elastomers, accounting for nearly one-third of world consumption in 2016. The major US consumption markets are automotive parts/components and TPO for roofing membranes. TPO roofing continues to grow faster than automotive uses, as it is considered a great choice for single-ply roofing for commercial construction. Mexico will continue to have the fastest penetration of olefinic thermoplastic elastomers in the Americas because of the country’s increased investment in automobile production and assembly. Central and South America has been in economic and political turmoil in recent years, which has impacted the consumption of olefinic thermoplastic elastomers, especially for automotive uses in Brazil. China’s share of global consumption increased significantly from 6% in 2006 to 8% in 2016, mainly because of the rapid increase in Chinese automobile production. During this 10-year period, Chinese automobile production grew at an average annual rate of just over 14%. The development of olefinic thermoplastic elastomers started relatively late in China, attributed to the limited supply of EPDM feedstock. With the rapid expansion of domestic EPDM capacity in the last several years, more Chinese producers have been making different kinds of olefinic thermoplastic elastomers. The automotive industry is the key consumer of olefinic thermoplastic elastomers; however, the main driving force has shifted from growth in automobile production to increased use per vehicle to support lightweighting. Based on the increasing demand for olefinic thermoplastic elastomers, it will be critical for Chinese producers to improve product quality, which would also reduce import volumes, since China is still the largest world importer. In Europe, 80-85% of the consumption of olefinic thermoplastic elastomers is tied to the automotive industry. After the declines during 2008-09 and 2012-13, automobile production experienced a strong recovery in Western Europe, as well as in Central and Eastern Europe. This resulted in a significant increase in TPO and TPV consumption in Europe during 2014-16. Growth in Central and Eastern Europe has been hampered by the recession in Russia in 2015-16 and the recession and war in Ukraine in 2014-15. This resulted in a decline in automobile production in Russia, and with that, a decline of TPO consumption in the country.